In stock market one has to be dynamic in approach and should be like a fluid and if possible like water where you are able to take the shape wherever you are placed. Moreover being like water means that you will flow with the trend of the market. 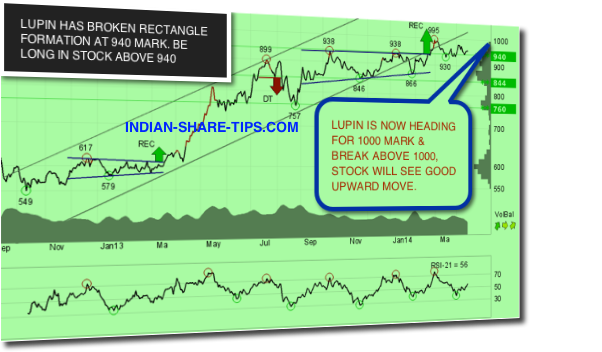 We are bullish on the prospects of Lupin since the time it has broken from the rectangle formation above 940 level and one can be long in the stock above this level and can undertake a reverse strategy below this level. The sign that stock has crossed its 21 day moving average at 959 is a bullish sign. First resistance now will be encountered at 993 level. Lupin has entered into a strategic joint venture agreement with Japanese pharmaceuticals company, Yoshindo Inc. to create a new entity, YL Biologics (YLB). YLB will be responsible for conducting clinical development of certain biosimilars including regulatory filings and obtaining marketing authorisations in Japan. The new entity YLB will in-license Monoclonal Antibodies (mAbs) from Lupin and also partner with other companies across the globe for the Japanese market which already has a clear cut regulatory regime in place for the development and commercialization of biologicals, stated a company release.